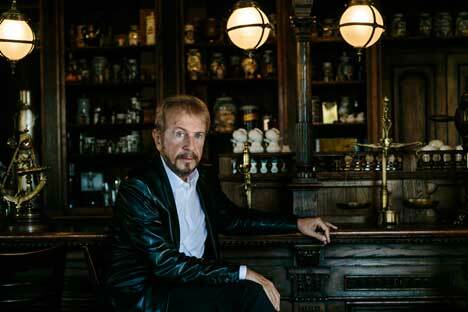 Andrei Dellos created Moscow’s iconic Café Pushkin. He spoke to RIR about what drives him and his restaurants, and what it takes to introduce Russian cuisine to foreign diners. Successful restaurateur Andrei Dellos tried his hand at a variety of careers before stumbling upon the one that made him well-known. Born in Moscow to a French father and Russian mother, he studied art and engineering, completed a course at the U.N. interpreters’ school and tried his hand as an artist in Paris. When a Russian company acquired several of his paintings in 1991, he volunteered to deliver them to Russia, and stayed on. He places the skills he honed as an artist and an interpreter to use at his legendary eateries, including Moscow’s Cafe Pushkin, named after Russia’s greatest poet Alexander Pushkin, the ‘Turandot’ restaurant, also in Russia’s capital, and his New York restaurant ‘Betony’, which has a Michelin star. Dellos spoke to RIR about food, art and Russian cuisine for different cultures. How did you come up with the name Cafe Pushkin? It existed in my head for 30 years. Because there is a song by Gilbert Becaud, “Nathalie,” in which he brings a Russian guide, the girl with whom he falls in love in Moscow, to drink chocolate at Cafe Pushkin. He wrote it about 60 years ago. But there was no such cafe; it was just a poetic fantasy. All the French who came to Moscow went to look for this cafe from the song. I thought this had to be corrected. Becaud himself came to the opening. His first words were: “I was sure I would not live long enough to see this moment!” And the brand has begun to live its own life. Did Yury Luzhkov, then mayor of Moscow, help you find an appropriate location? Yes, he liked my restaurants. Once he asked me about my plans. I told him about Pushkin, about the song by Becaud. He said, “So let’s do it, we have the 200th anniversary of the poet’s birth just around the corner.” I said that it should be opened only near Pushkin Square, but there is no free square centimetre there. The next day he called me at 7 a.m. and said he had found the place, but only provided that the cafe would be opened by the anniversary. As a result, we built what usually takes three years in just five-and-a-half months. And it was built in such a way that it is the only restaurant in which the interior has not changed since the opening. Did you come up with the interiors of the restaurant yourself? Everything was done according to my sketches. The interiors were recreated by modern masters, but inhabited by a huge number of authentic things from the 19th century. I hear you collect art yourself. I am a strange collector — I collect parts. That is, pieces of furniture and decoration from the past centuries. Sometimes I amuse myself with using them to make something completely new. These can be things from the School of Fontainebleau, the Italian Renaissance, Mannerism. Many elements have been used to create Turandot. Turandot shocks many with its luxurious interiors. People are not used to eating in a museum. It was interesting for me to explain to Muscovites and to the rest of the world what chinoiserie is, which is present in St. Petersburg but not in Moscow. A small school of arts is constantly working here; the staff was prepared so as to be able to tell visitors all about the interior, if they have questions. This is one of the exams to be passed by everyone who works here. Why did Café Pushkin in New York close? There were a number of unforeseen challenges, including the fact that the restaurant attracted far more nostalgic Russian diners than we anticipated, which affected the way New Yorkers viewed it. The timing was also bad in that Hurricane Sandy struck and there was an economic downturn. So you decided to open Betony in its place. Yes, I met two absolutely brilliant rising stars, Chef Bryce Shuman and General Manager Eamon Rockey, who is also one of the country’s leading cocktail experts. Both worked at New York City’s revered Eleven Madison Park as well as other top restaurants. I saw the opportunity to give these ambitious young men a lot of autonomy to create a contemporary American destination restaurant and my trust has been rewarded. The restaurant has garnered a lot of acclaim — Chef Shuman even won a Food & Wine magazine “Best New Chef” award this year — but are determined to keep pushing and make it one of the world’s best restaurants. But before that, you brought Pushkin to Paris. In France, it was a completely different game. To open a confectionery in France — it was an exotic form of suicide. France is a confectionery country. And we went for a serious provocation. But we have been there already for four years and [Russian honey cake] medovik is a hit with the French themselves. There are plans to open cafes under this brand in major cities in the Middle East. And now we will make a second opening in New York. What is the project there? A restaurant in the same direction as Betony, but we will do it in a more simplified form. Do you think there is not enough Russian cuisine in New York ? It’s a difficult question to answer. New Yorkers are some of the most curious, open-minded diners in the world. (If they weren’t, they wouldn’t be living there.) That said, the market is quite fickle. I think if the food is contemporary Russian-influenced, and the décor wholly contemporary, there is a possibility of it being embraced. You opened the restaurant Café Pushkin in Moscow in six months. The opening in London was announced almost two years ago, but it has not yet happened. Crisis? We have barely managed to start the construction. This is due to the British system of development control, which takes loads of time. It cannot be called crisis. This is Berkeley Street, the heart of London. A lot of permits are needed. We are planning to open next year, I think most likely in the autumn. But you have to understand, I do not want to make a copy of the Moscow restaurant, especially in the field of gastronomy. We are actively cooperating with a number of brilliant chefs — French, American, British — thinking through the menu. Will restaurants abroad have some Russian-style items? It will necessarily be there. There will be always Pozharsky cutlets. Of course, pelmeni (Russian dumplings), which enjoy great success in France. What would you include in an imaginary noble dinner at Café Pushkin? First, of course, you should try borsch! The main dish is, of course, Pozharsky cutlets. And as a hot appetizer – pelmeni. This is a must; this is what they have in Paris; you just can’t avoid it. For the dessert, there is medovik. What audience is the most enthusiastic about the subtleties of your Russian cuisine? If you take Europe, the French and Germans like it most of all. It’s amazing with what delight the Japanese react; they are in love with Russian pirozhki. There is something that corresponds to them. Even at Printemps in Paris, a Japanese girl comes by, tries pirozhki and gapes. She immediately calls her friends, and they buy pirozhki just by the dozens.